It was rather a slow night, I had been wandering around through the dark forest for hours without much to show for it when I saw a flash of color on a distant leaf. I made my way towards it and came upon this scene, a large and menacing looking Sparassid chowing down on the remains of what I think may be some sort of giant shieldbug (family Tessaratomidae). 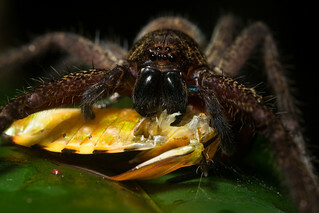 I was never able to ID the spider down to a species but whatever it was they were abundant in the jungle at night. This one was positioned in a way that with a little effort I was able to get down to its level and shoot it head on, of course being careful not to startle it or cause it to abandon its colorful meal. While certainly scary looking, Huntsman spiders pose no real danger to humans and actually consume many pest species of insects.